Unless you're at the Adler Planetarium, stargazing is best done away from Chicago's bright lights, taking advantage of all the secluded, open-air spots outside the city. 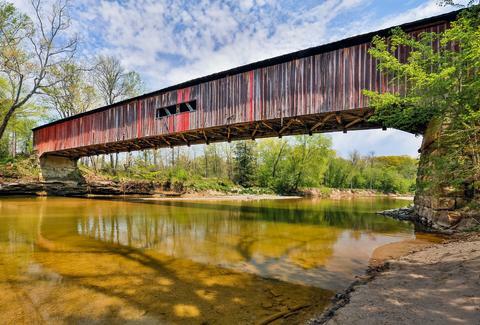 Situated along the sand dune-lined Great Lakes or within quiet, canyon-filled parklands, there are perfect campgrounds just a short drive from Chicago. And if sturdier barriers between the local woodland critters and your sleeping body are more your style, there are plenty of nearby cabin options for your next budget-friendly, outdoor retreat. So get out there... winter is coming. Wisconsin's expansive state forest area encompasses gorgeous glacial landforms and hilly terrain, and your pick of 750 campsites, 250 miles of hiking trails, 75 miles of off-road biking trails, and nearly 100 miles of cross-country ski paths. Divided into units -- two large (Northern and Southern) and three small (Pike Lake, Loew Lake, and Lapham Peak) -- the forestland covers a 100-mile stretch of the state. 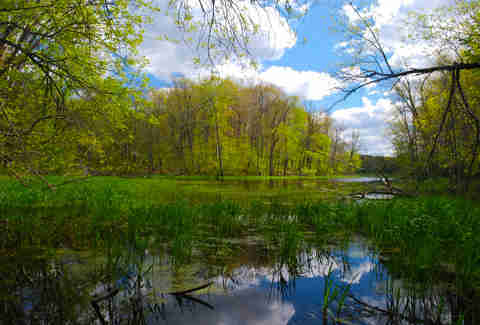 Only a couple hours from Chicago, the Southern Unit's Mauthe Lake Campground offers year-round camping near Kettle Hole Woods and the southern end of the Ice Age National Scenic Trail, a moderate to difficult 31-mile course running through all five forest units as it follows sinuous eskers, tumbled moraines, bogs, and deep kettles. 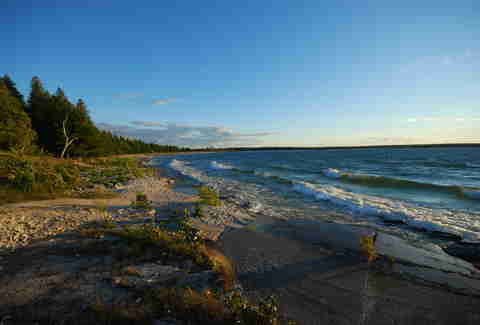 Pitch your tent a stone's throw away from the longest public swimming area of any state park. During the campground's peak season, May through September, you'll need a reservation and permit to access more than 240 sites with showers, firewood, and electricity. 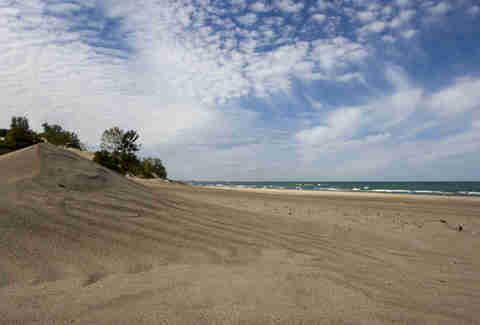 In addition to relaxing on the beach, campers can explore the unique landscape of sand dunes, marshes, forest, and cacti-speckled prairies or take advantage of the bike trails. If glamping is more your style, stake out a room at the Illinois Beach Resort, the state's only resort on Lake Michigan. While the campground isn't actually located within the spectacular Illinois park best known for its fascinating rock formations, its secluded and spacious year-round campsites only two hours from the city are still worth reserving. After a day of hiking, picnicking, fishing, canoeing, and even horseback riding amid tree-covered canyons and sandstone bluffs with outstanding views overlooking the Illinois River, your tent's wooded surroundings (with access to electricity, showers, and restrooms) will be a welcome respite come nighttime. Pro tip: Starved Rock's big draw is the 13 miles of easy-to-navigate trails exploring moss-covered canyons with waterfalls, but the nearby Matthiessen State Park and many wineries can round out the camp experience. 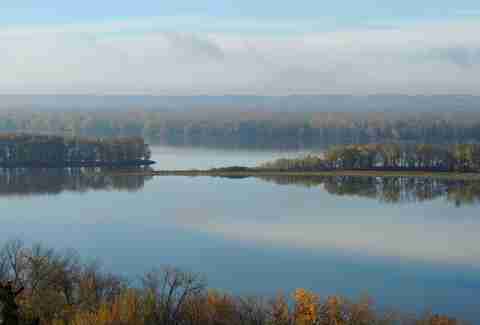 The 2,500-acre state park near the confluence of the Mississippi and Apple Rivers in northwestern Illinois holds a rich American Indian history. 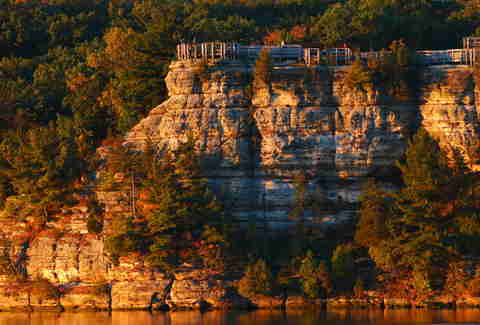 Campers can navigate the same dramatic bluffs, limestone caves, and wooded ravines Native American pathfinders once coursed along the rock palisades. The 15 miles of varied and rugged trails give hiking aficionados ample terrain, and rock climbers with their own equipment can tackle Twin Sister and Indian Head, two of the most popular rock formations open for climbing. The park has 241 reservable campsites, and another 141 campsites that are first-come, first-serve. 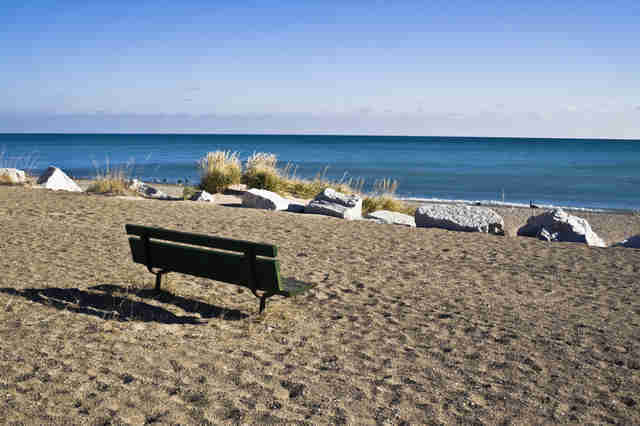 Named after the founder of Michigan's state parks system, this 1,200-acre park features over three miles of Lake Michigan shoreline, towering dunes, and 10 miles of stunning footpaths and Nordic ski trails. The 193-step Dune Climb Stairway leads to panoramic views from the tallest dune and three miles of trails turn into hilly cross-country skiing in the winter. 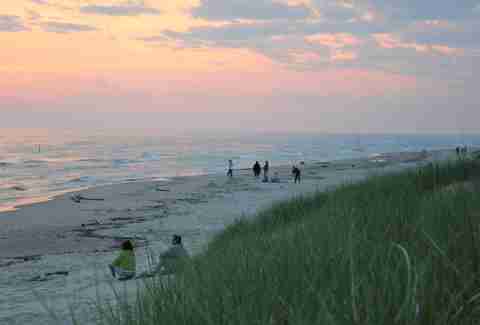 Access the trail system from the park's day-use beach area, the forested 293-site modern campground and smaller, semi-modern beach campground (both open April through October), or the Gillette Sand Dune Visitor Center, a nature center with interactive exhibits devoted to the state's freshwater dune ecosystem. 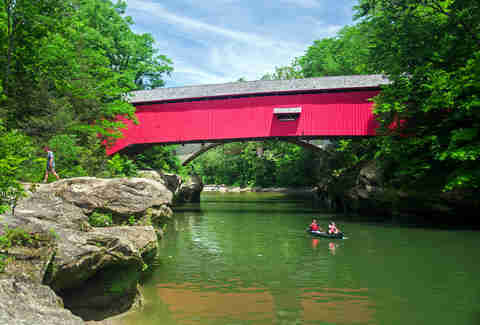 Situated just southwest of Crawfordsville along State Road 47, this Indiana state park gives visitors a chance to marvel at natural geologic wonders like cavern-like sandstone ravines and take in scenic views while canoeing Sugar Creek. Take a break from the weekend's rugged hikes and sun with a nature center customized with a planetarium or the cabin commemorating Colonel Richard Lieber, the father of Indiana's state parks. Stake out a sleeping and stargazing spot in one of the park's many on-site campgrounds or check out the private outfitters in the area that offer camping and more near Turkey Run. The more than 2,000 acres of federally protected Hoosier landscape offers the best of both worlds: beautiful forests and picturesque, monumental sand dunes. Crashing at one of Indiana Dunes Campground's spotless 140 campsites near the Lake Michigan shoreline gives campers the perfect place to soak up all the outdoor vibes from trail hiking to beach lounging year-round. You can always change up the beach scenery a bit by moving your pad to Dunewood Campground's wooded walk-in/drop-in sites. A longer road trip and short ferry ride out to Lake Erie's "Emerald Isle" will score you the ultimate getaway. 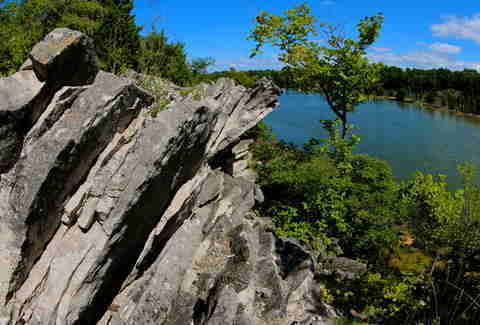 Nature enthusiasts and vacationers seeking a relaxing, secluded retreat will find a 677-acre state park on the island's northern shores, a shoreline of low cliffs and limestone shelves, glacial grooves, and quarries. Make the most of your journey to Ohio by trying out the hassle-free yurts or rent-a-camp units, or even extending the weekend stay to hit up Cedar Point's coasters or island campground hopping at nearby South Bass Island, Middle Bass Island, and East Harbor State Park. But before you detach from the mainland, be sure to claim your spot. Further north along the Lake Michigan shoreline, reputable high dune formations are only minutes away from South Haven's charming shops and restaurants. Pick up snacks in town before strolling the mile-long sandy lakefront stretch or winding along the woodland paths in search of a prime picnic spot. While none of the 220 reserve-able modern campsites have views of the lake, it's a mere 400-yard jaunt to the beach and each site is equipped with a picnic table and fire pit. Free weekly concerts at Riverfront Park entertain guests throughout the summer while the Michigan Maritime Museum and Kal-Haven Trail linking South Haven and Kalamazoo offer historical points of interest in the off-season. It's not often you'll find truly primitive campgrounds within driving distance, but if you make the trek from Chicago to Wisconsin's Door County islands, you'll reach gloriously uninhabited territory. Off the tip of the peninsula, the vehicle-free Rock Island is home to Wisconsin's oldest lighthouse, hiking trails, and 2,000ft of beach. The seasonal passenger ferry from Washington Island connects visitors to the island's walk-in camping. 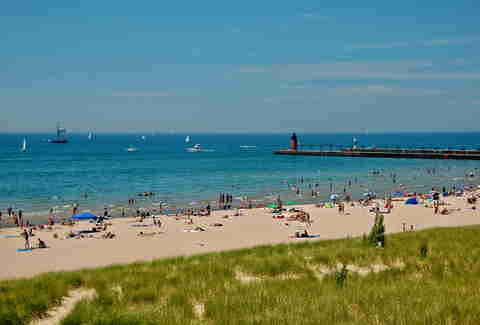 You can do your business in campsite pit or picnic area flush toilets, but you'll have to bathe in Lake Michigan. Nicole Bruce is a contributing writer for Thrillist. She finds it's best to sleep on rocks after 10 hours of hiking or four hours of drinking while floating down a river. Find her on Twitter at @nicoleabruce.